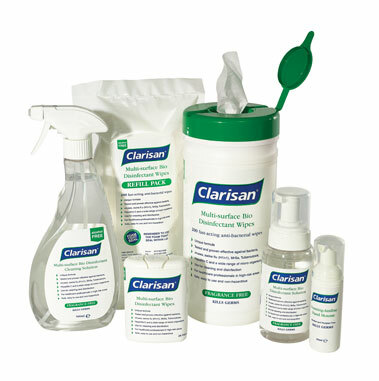 The Clarisan family of products was created by a team of dedicated professionals, who fully understand the needs and necessities of infection control. Established in 2006 Clarisan (reg trade mark), the ultimate name in cleaning and sanitising arrived. Clarisan offers an exceptional range of highly effective products from simple functional packs to high end retail units. Clarisan clients include - doctors surgeries, dentists, vets, health clubs, pubs and hotels to name but a few…. schools, universities, colleges and office complexes also form many of our happy clients. The Clarisan range is split between a range of alcohol based lines, and non alcohol based content. Both ranges are proven highly effective against infection control. Clarisan products are fully tested and conform to BSEN 1500. Clarisan, as a brand of WePack Ltd, is well placed to offer any of the range to our clients, as “own label products”. A small minimum order quantity applies, but almost any bottle or container format can be accommodated at our Midlands based filling / packaging facility. We would like you to be free to browse our website, which includes Clarisan gels, sprays, foamers and wipes, and do call us or email us with any questions you may have whatsoever. The Clarisan team are here to listen and help! Please take advantage of our low-cost sample service, should you be unsure of the right products for you or your company.